← Was Caesar, the Alaskan Malamute, poisoned? Security guards: Only Malaysians and Nepalese allowed! Did UMNO create the Frankenstein that passes for private security in Malaysia? The killer-robber and his accomplices are NOT Malaysian! Security Services Association of Malaysia president Datuk Shaheen Mirza Habib said that under the Private Agency Act 1971, security firms are only allowed to hire Malaysians or selected Nepalese to work as security guards here. Shaheen also believes 30% or 150,000 security guards in the country were illegals. Out of the 92 arrested, 60 foreigners were working without valid documents and two were caught for working on expired visas. Police show off pump guns seized from a recent operation. Sixty foreign security guards who did not possess any documents were among 92 guards arrested in a recent special operation in the Klang Valley. KUALA LUMPUR: Sixty foreign security guards who did not possess any documents were among 92 guards arrested in a special operation in the Klang Valley on Wednesday and Thursday. City deputy police chief Datuk Abdul Hamid Mohd Ali said a team from the City Police Licensing Department conducted 815 checks on armed guards and static guards in various locations including schools, shopping malls, banks, jewelry shops, money changers, neighbourhood areas and construction sites. Police also arrested 32 security guards for other offences including testing positive for drugs (3); expired visa (2), on the police wanted list (1); on a police warrant (1); permit abuse (23); fake identification documents (1); and permanent resident (1). PETALING JAYA: A police operation targeting illegal security guards saw 92 of them, mostly foreigners, being detained for working without valid documents or with expired visas. Two Malaysians wanted for other offences were also arrested during the operation on Wednesday and Thursday that comprised 815 checks, mostly at banks, shopping centres, housing areas and money changers in the city. Police also confiscated four pump guns belonging to four armed guards, while three tested positive for drugs, and one was detained for working under a false identity. “Operasi Bersepadu Penguat­kuasaan Pematu­han (Compliance Enforcement Operation) was aimed towards armed and static guards (unarmed),” said City deputy police chief Deputy Comm Datuk Abdul Hamid Mohd Ali at a press conference yesterday. Watching the watchmen: A security guard from Bangladesh manning a security post at a housing area in Petaling Jaya. PETALING JAYA: A crackdown on illegal security guards by the Immigration Department is giving residents of guarded communities the jitters. The department is coming down hard on guards who are from Indonesia, Bangladesh, India and Pakistan. This is because under the law, only Nepalis can be employed as security guards but such guards are expensive. Immigration director-general Datuk Sakib Kusmi said operations to weed out illegals working as security guards would go on. “Some of them came in for work in other sectors but ended up as security guards,” he told MStar in an interview. Some residents are worried that the crackdown will leave them without guards and that crime in their areas will spike. “If there is a shortage of guards, we will have to bear the risk of more break-ins and other crimes,” said Hoh Choo Kim, 61, chairman of the USJ20/ 1-3 RA. Sakib, however, said the department was looking at reviewing the policy, which was introduced in 2006. “It is not so easy to get Nepali guards with a military or police background these days. “A review will allow trained guards from other source countries to be hired,” he added. Sakib noted that such guards would still be required to have military or police experience. He warned that housing associations and their management could face problems if they hired un­trained foreign security guards. “They (the guards) can easily run away anytime they do something wrong,” he added. He also said the review could consider allowing locals with a military or police background to be employ­ed as housing area security guards. “We have many Malaysians who are former army or police personnel. They can be trained to be security guards,” he added. ETALING JAYA: The ruling that only Nepalis can be hired as security guards may soon be lifted to allow foreigners from other source countries to take on the job. Deputy Home Minister Datuk Nur Jazlan Mohamed said the review of the decade-old policy comes in light of recent nationwide operations to weed out illegals, including those hired as security guards. “We may have to look at other source countries that have a good supply of security guards with military background, such as Sri Lanka. “Formerly, the job was reserved for Nepalis owing to their reputations as Gurkhas,” he said yesterday. However, he said a limited supply of Nepali security guards has forced some companies to hire other nationals. “The supply of Gurkhas is very limited as not all Nepalis were in the army. “Some companies hire other foreigners and this is not allowed under the current policy,” he said, adding that there were about 800 licensed security guard companies. WILL THIS GUARD TURN OUT TO BE A MALAYSIAN OR FOREIGNER? SUBANG JAYA: The driver of a security armoured car made off with RM250,000 while his security guard colleagues were depositing another consignment of cash into a bank in Jalan SS16/1 here. One of the security guards later lodged a police report at the Subang Jaya police station. The guard claimed in his report that during the incident yesterday, he, along with the driver and another security personnel, had been transporting a consignment of cash, which they were tasked to bank in on behalf of their clients. He alleged that they had stopped at a bank in Wisma Consplant here, where he and his colleague took half of the consignment while the driver waited in the armoured car. Inside the armoured car, there was still RM250,000 belonging to two gas stations and a fast food restaurant that was meant to be deposited in another bank. However, the guard said when they came out of the building at around 9am, both the driver and car had vanished. WHEN THE GUARDS WORKING FOR BANKS, SHOPPING MALLS, GATED COMMUNITIES, ETC, MAY BE FOREIGNERS USING FAKE MYKADS, HOW DO WE KNOW WHERE THE DANGER LIES? If you were at a shopping mall, would you feel safe and secure to see a security guard around? What about the security guard in the bank where you work? WHEN THE PRIVATE SECURITY SERVICE INDUSTRY IS PLAGUED WITH SUCH A SERIOUS PROBLEM, WE ARE REALLY IN DEEP S***! WHOSE FAULT IS IT? THE HOME MINISTRY BLAMES THE SECURITY INDUSTRY BUT SOME SECURITY FIRMS SAY THAT IT IS THE HOME MINISTRY THAT IS TO BLAME! Why? This is because approval for the guards’ employment comes from the ministry itself. If anyone is to be blamed, it is the ministry’s screening system. Raids were conducted in residential areas, condominiums, apartments, supermarkets, hotels and parking lots in the four police districts. Police have arrested 76 foreign security guards for various offences in integrated operations in Kuala Lumpur, in the localities of Sentul, Brickfields, Dang Wangi and Cheras. All the guards, still in full uniform, aged between 28 and 45 years, were taken to the KL police headquarters for further investigation. Kuala Lumpur CID deputy chief ACP Khairi Ahrasa said the 34 Nepalese, 20 Pakistanis, 11 Indians, six Indonesians, two Sri Lankans and two Bangladeshis and a Filipino were arrested for not possessing valid travel documents, having expired permits, breaching their work permits and possessing somebody else’s identity card. KUALA LUMPUR: SECURITY companies being shaken down by authorities because of some guards going rogue are crying foul that the blame is landing entirely on them. They said the mandatory punishment of having their operating licences revoked, if they were found to have engaged guards who had failed to meet the required standards, was unfair. Instead, they are asking that the Home Ministry check on the effectiveness of its own screening and verification system. The recent cases of rogue security guards found to be in possession of fake MyKad have left many of them perplexed. This, they said, was because approval for the guards’ employment came from the ministry itself. If anyone was to be blamed, it would be the ministry’s screening system. PETALING JAYA: Some security firms are arming their guards without waiting for police approval of the carry-and-use permit. Federal Police Management Director Comm Datuk Mortadza Nazarene said regulations required the companies to apply for firearms licences first. Comm Mortadza said the firms did not adhere to the regulations due to several factors. Comm Mortadza said the approval to carry firearms came straight from the office of the Inspector-General of Police. SUBANG: Seventeen foreigners working as security guards were detained in a joint operation by the Immigration Department, the National Registration Department and the Home Ministry. The men were detained at two separate locations yesterday – a hypermarket in Shah Alam and a mall in Subang after they failed to produce identification documents. Putrajaya Immigration Depart­ment assistant director Izzat Mohd Jamil said two Malaysian supervisors were also detained. “We suspect the foreigners, who claimed they were from Nepal, were employed without proper work permits,” Izzat said. While the main suspect and his accomplice are in remand for seven days, the police are looking for a Filipina who the cops believe are keeping most of the jewellery. PETALING JAYA: Kuala Lumpur police are in the hunt for a Filipino woman believed to be the lover of the security guard who robbed a jewellery outlet at a shopping mall in Setapak on Thursday. When contacted, Kuala Lumpur CID chief, Ku Chin Wah told FMT that police are currently searching for the woman as they believed that the lady is keeping most of the stolen jeweleries. “We are now looking for the woman to assist us with the investigation. We believe that she is keeping most of it,” he said. “Initial investigation shows that the woman is the lover of the main suspect,” Ku said in an SMS reply. Ku then added that both suspects detained at the low-cost carrier terminal (LCCT) airport on Sunday are currently on remand for seven days. Two men, who used fake identity cards, were nabbed while waiting for a flight to Sabah at around 7am. KUALA LUMPUR: Two Filipino men, one of whom believed to be the main suspect in the heist at a goldsmith shop at KL Festival City shopping mall, Setapak here last Thursday, were arrested at the Low Cost Carrier Terminal, Sepang today. Kuala Lumpur deputy police chief Amar Singh Ishar Singh said the two men, who used fake identity cards, were nabbed while waiting for a flight to Sabah at around 7am. “The 27-year-old suspect also admitted committing the robbery at the goldsmith shop. Further interrogation led the police to a house in Pandan Jaya where a Smith and Wesson pistol with five bullets, a pistol cover and several price tags for gold chains were found,” he told Bernama when contacted. Amar Singh said with the arrest, the robbery case was considered solved. 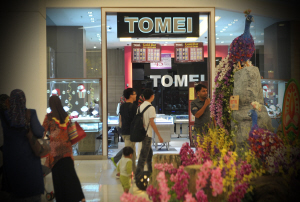 KUALA LUMPUR (Nov 2, 2013): Police detained two men in raids in Shah Alam and Sentul to assist investigations on a robbery case at a jewellery outlet by a security guard at the KL Festival City shopping complex, Setapak here. Kuala Lumpur CID deputy chief (Operations and Intelligence) ACP Khairi Ahrasa said they were detained at their homes. He said, in the first raid, a 26-year-old man, believed to be the suspect’s friend, was detained at 9pm, last Thursday. He said in a follow up operation, police arrested another man, aged 51, believed to be the supervisor of the security guard. The authorities have announced the arrests of 20 security guards, all presumably licensed to carry guns, for holding fake Malaysian documentation. That may just be the tip of the iceberg. Security guards with fake ICs and guns? There is now a serious problem of identifying who is a genuine Malaysian and who is not because of the rampant unlawful issuance of MyKads to foreigners in Sabah. The irony of the uproar in the peninsula over 20 security guards holding fake identity documents has not been lost on Sabahans. For decades they’ve been shrilly blowing the whistle on the incredible growth of their state’s population. Something was up and it wasn’t birth rates but no one paid attention. Former prime minister Dr Mahathir Mohamad cannot remember things that happened during his watch and neither the Home Ministry nor the security agencies, nor the National Registration Department has done anything to address the issue. In the meantime, governments and ministers were appointed with a little help from the additional inhabitants who found themselves on the electoral rolls. A brief but bloody invasion that took place earlier this year also failed to jog memories though the finger was pointed at the auxiliary population of hundreds of thousands of new Malaysians mostly hailing from just across the border in the Southern Philippines and some as far off as the other side of the Bay of Bengal and the Karakoram ranges. Things however got seriously out of control about a week ago. A security guard, first said to be from Sabah and then found to be from Indonesia, and holding a fake MyKad, shot dead a colleague in a bank in the peninsula and took off with a bag full of cash. All hell broke loose. The authorities released a series of grave statements announcing they were investigating the serious breach of security. Now Sabahans are left scratching their heads. What’s the big deal? They had prophetically warned that their state was on the verge of a reverse takeover that many now believe has been virtually accomplished. But the gift of prophecy turned out to be useless for them. Now as the sound of the deadly shot fired during a robbery at a bank in Subang Jaya reverberates, the authorities in the peninsula are squirming. AMBANK HAS NEW SECURITY GUARDS! AmBank Group yesterday said it had terminated its contract with Kawalan Prima. “The group has appointed replacement security personnel and will continue to source additional personnel to be placed in affected branches. Our priority is to ensure the safety of our staff and customers. KUALA LUMPUR: The Home Ministry yesterday announced that all operations by Kawalan Prima Sdn Bhd, the security firm that had its licence revoked after its guard shot dead a bank officer, is now illegal. Minister Datuk Seri Dr Ahmad Zahid Hamidi also warned the firm’s clients to cancel their contracts immediately or face the consequences. He said based on media reports, it was understood that the company was still operating as usual before the ministry’s Safety and Public Order Department officers went to its headquarters and branches to shut down their operations yesterday morning. “We have classified any operations by them as illegal and will take them to court if they disregard the order,” he said at Parliament lobby. Zahid said the weapons used by guards at the firm had been seized by the ministry. MELAKA (Oct 31, 2013): Eight foreign security guards and 11 guest relations officers were among 40 foreigners detained by the Melaka Immigration Department for various offences in raids at four locations late last night. State Immigration deputy director (Control) Abu Bakar Sidek Hasan said in the operation which began at 11pm and lasted more than six hours, eight Nepalese security guards were detained at two factories in Krubong, here. “So far, more than 50 security guards were detained throughout Ops 6P and we will continue to find foreign security guards who have no legal documents,” he said in a news conference here today. PETALING JAYA: Security firm Kawalan Prima Sdn Bhd has to surrender its firearms and stop operating by today, said Deputy Home Minister Datuk Wan Junaidi Tuanku Jaafar. He said the company was served a show-cause letter on Oct 25 that expires today. “The company only responded to the letter on Tuesday. They have to stop operating by tomorrow (today),” he said when contacted yesterday. “The security unit in the Home Ministry has been instructed to do what is necessary, including raiding their offices and confiscating their guns. The action is not so immediate because we have to give them notice,” he added. The ministry immediately revoked the operating licence of the security firm that hired the guard after it was found to have breached requirements under the Private Agency Act. The security firm had not carried out a security vetting of the guard. It seemed to be business as usual at Kawalan Prima yesterday. “We are operating as usual and all our branches are open,” said a staff member who answered the phone yesterday. The woman, who did not identify herself, said executive chairman Capt (Rtd) Datuk Abdul Halim Yom, director of operations Iqbal Halim and finance director Intan Shafinaz Halim were not in. Kawalan Prima is based at Wisma Lim Foo Yong in Jalan Raja Chulan, Kuala Lumpur, and has 11 branches nationwide. According to the website, Halim is a former officer in the British army and is patron of the Malaysian Ex-British Army Association. The Security Services Association of Malaysia website listed Halim and Intan as shareholders of Kawalan Prima along with Hayati Halim, Kasmah Halim, Sarjet Singh Dershan, Manjit Singh Dershan and Manmant Singh Dershan. The security guard, a Sabahan with a fake ID, robbed his jeweller employer of 93 necklaces. KUALA LUMPUR: An armed security guard from Sabah with a fake Identity Card, robbed a goldsmith shop in Setapak which he was tasked to guard, at gunpoint this morning. The 26-year old guard stormed into the the premise in KL festival City Mall shortly after it was opened for business at about 9am and pointed his gun at the seven workers including branch manager. The goldsmith shop in KL festival City Mall in Setapak which was robbed at gunpoint by its own security guard. The lone suspect, a Sabahan with a fake ID, robbed his jeweller employer of 93 necklaces. PETALING JAYA: It has only been about a week since a bank security guard shot an officer in the face before fleeing with RM450,000. The suspect is still at large. Today, another armed security guard took to crime, robbing a jewellery shop of 93 necklaces with the loss yet to be ascertained. According to the Sentul district police chief ACP Zakaria Pagan, the recently employed security guard merely submitted a photocopy of his identity card when he applied for the job. It was learnt that the security guard armed with a pump gun did not fire any shots during the robbery as the shop was about to open for business. “The robbery took place at 9.45am and the suspect did not fire any shots thus no one was injured. He worked at the jewellery shop for a month ago,” Zakaria said. At press time, police were still investigating how the lone suspect, believed to be armed with a pump gun fled the scene with the loot. PETALING JAYA: An armed security guard robbed a jewellery outlet at the KL Festival City Mall in Setapak near here Thursday. The robbery occurred around 9am and a police source said the suspect was identified as a Sabahan but is believed to hold a fake identity card. The security guard, who had been on the job for less than two months, had pointed a pistol at the store owner and escaped with a tray of jewellery around 9am. City deputy CID chief Asst Comm Khairy Ahrasa said the owner and the three staff in were getting ready to open the store at the time. “They had read about what happened at the bank and quickly gave him a tray of jewellery out of fear,” he said. The guard, still in his uniform, took the tray and casually walked out of the mall. Qualified or not? : In light of recent incidents, businesses have been contacting security companies asking for their guards’ particulars to ensure safety. PETALING JAYA: Big security companies are sub-contracting their work out to smaller unqualified firms to operate under their name for profits. Industry players claim that the vetting and hiring of guards are left to the discretion of their sub-contractors. Labelling them as “franchises”, Chico Force Sdn Bhd chief executive officer Datuk Seri Juniur Khoo said such firms were “destroying” the integrity of the security industry. “These small firms generally cut costs by not properly hiring and training guards,” Khoo claimed. He said such action allowed the firms to offer security services at a lower cost compared to other companies whose guards go through the proper vetting and training process. “People would go for the cheaper alternative but don’t realise they (the firms) offer poorer services, which should not be allowed,” said Khoo, whose firm manages security at several major malls. This entry was posted in Uncategorized and tagged Armed guard robs jewellery outlet in Setapak, crime in malaysia, security guard in armed robbery, selangor, setapak. Bookmark the permalink. 3 Responses to Security guards: Only Malaysians and Nepalese allowed!